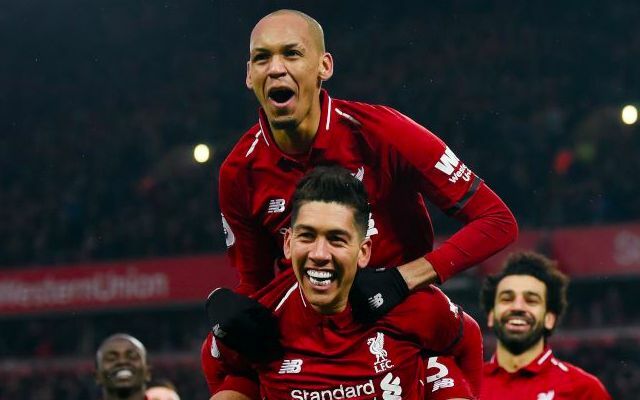 Liverpool anchorman Fabinho has explained how Roberto Firmino sold him the Liverpool dream last summer. We acquired the Brazilian from AS Monaco, just a few days after our Champions League Final defeat to Real Madrid – which certainly did its bit to perk up the fanbase! Fabinho started slowly, struggling for minutes as Jurgen Klopp decided not to risk him until he was tactically up the scratch – but he’s now one of the first names on the team-sheet. “Bobby (Firmino) played an important role in me coming here,” he told Sky Sports . Our goalkeeper Alisson is also Brazilian, while Rafa Camacho is Portuguese so speaks the same language. Coutinho and Lucas are no longer at Liverpool, but we’ve had a Brazilian element to the squad for some time now! Firmino is perhaps not enjoying his best season individually, but he’s still completely vital to Klopp’s tactics – even when he isn’t scoring goals. We’d suggest Fabinho is now ahead of captain Jordan Henderson in the central midfield pecking order, too.